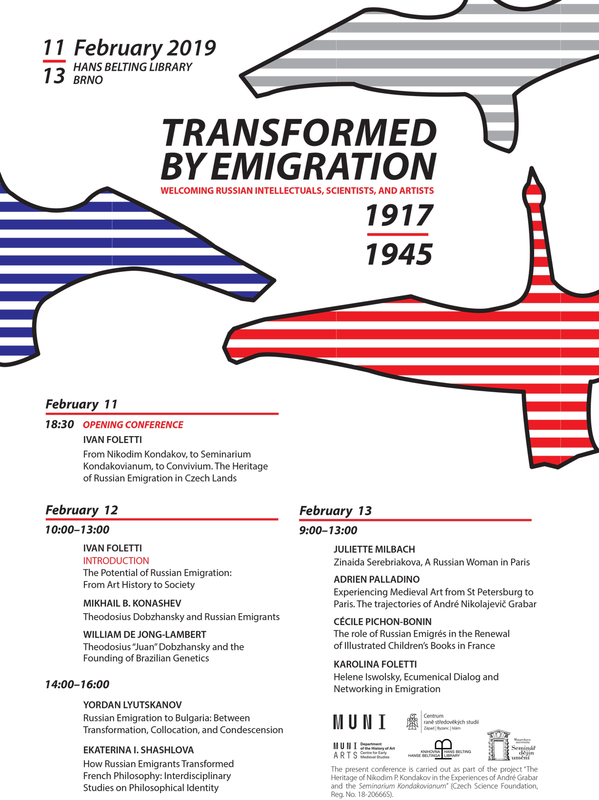 The members of the Center for Early Medieval Studies at the Department of Art History would like to cordially invite you to the conference entitled TRANSFORMED BY EMIGRATION. Welcoming Russian Intellectuals, Scientists, and Artists 1917–1945, which will take place in the Hans Belting Library from the 11th-13thFebruary 2019. The aim of this conference is to expand the discussion on Russian emigration in the most interdisciplinary way possible. The impact of emigration on sciences as well as the arts will be explored in a broad sense, through the disciplines of biology, art history, philosophy, arts, or literature. The main focus will not be only on individual stories, but how these individual moments established new dialogues that transformed the cultural, scientific, and artistic world – with a still notable impact on the world of today. In sum, the aim of the conference is to reflect on the transformative effects of elite emigration on the national and supranational structures receiving them and vice-versa.